Astonishing indeed. The recent rains have watered the Earth like one of those old terracotta chia pets, and now mushrooms sprout from every sodden surface. In the breathless shade of a hemlock forest, I wandered among the buzzing mosquitoes and stoic trunks, fairly tripping over fungi. The trees dripped with a thunderstorm’s leftovers, and (looking forward to snowflakes instead of bugs) I stopped to catch a drop on my tongue. Bright orange globs of hunchbacked lobster fungus, sunshine-yellow spikes of club fungus, and the glowing white cap of a Destroying Angel illuminated dim, shadowy duff. Without a guide—human or paperback—I simply admired the diversity of colors and forms, identifying only a few of the most distinctive organisms from my tenuous memory. In these forest soils beneath my boots, 90% of the living biomass is fungal. An interwoven mat of mushroom mycelia connects trees with resources, returns nutrients to the soil, and exchanges information. Some call it the “wood-wide web.” Mycologist Paul Stamets calls it “Nature’s Internet.” I see a fascinating parallel with my own internal microbiome that I wrote about last week: For every human cell in my body, there are about 10 resident microbes. They help me digest food, tune my immune system, and even alter my mood. None of us is ever truly alone. Mushrooms make pretty good company, I would say, and perhaps that is because mushrooms are more closely related to animals than they are to plants. For one, plant cell walls are made of cellulose, while mushroom cell walls are made of chitin. Chitin is the stuff of crab shells and butterfly wing scales. It doesn’t exist in plants. Plants are autotrophs – they make their own food out of sunlight, water, and air. Fungi and animals are heterotrophs, who get their energy by breaking down food they find. Plants exhale oxygen; fungi and animals inhale it. Despite the incredible community of life here, this magical place (“Fairyland” is its official name) was a source of solace and solitude for a young Mary Griggs Burke. Out of her love of these woods grew an admirable land ethic. She wrote "I am glad more people are enjoying the beauty of nature--but only if people value the land and treat it with respect can they preserve what they enjoy." And with that in mind, she founded the Cable Natural History Museum. These woods are full of connections. I wouldn’t be here without Mary’s foresight, generosity, and love of nature. The trees would not be here without the mycorrhizal fungi that extend their root systems. Each tree has hundreds of thousands of miles of fungal threads associated with its roots. The fungus supplies the tree with nutrients and water. In exchange, the tree provides sugars synthesized with the sun. Scientists are discovering that sharing – symbiotic relationships – among highly diverse and unrelated organisms is more important than they used to believe. “Life is a network of cross-kingdom alliances,” says theoretical biologist Lynn Margulis. A few days later, when I brought a multi-generational family into Fairyland with me, it only seemed to multiply the magic. More eyes saw more fungi, and more people exclaimed exuberantly over mushrooms, too. While Rachel Carson wrote that “If a child is to keep alive his inborn sense of wonder, he needs the companionship of at least one adult who can share it, rediscovering with him the joy, excitement, and mystery of the world we live in," I’ve found that adults need such a companion as much or even more. So, we discovered things together. This time I carried the “Lone Pine Field Guide to Mushrooms of Northeast North America.” From there, we learned that the tiny, red-orange cups sprouting from a rotting log are named “Eyelash Fungus.” When we leaned in closer, the fringe of black “eyelashes” on the margins became visible. Chuckles of appreciation rippled through the group. The next find was a patch of little clubs with fleshy, creamy white fans atop darker, somewhat velvety stalks. The name “Velvety-Stalked Fairy Fan,” seemed amusingly appropriate. I don’t feel like we need to know the names of everything in order to appreciate them, but sometimes it does add to the fun. “Look here,” whispered the family patriarch with a wiggle of his toe. At the end of his shoe we found an elfin grove of two-inch-high black clubs. They blended in so well with the shadows and damp wood, that we were quite proud of ourselves for spying them. But the name, “Common Earth Tongue,” seemed like an insult to our keen observation skills. Nearby, a cluster of similar, but yellow, clubs sprouted cheerily in the gloom. The name, “Yellow Earth Tongue,” endeared us a bit more. Tongues of the earth, indeed, these fungi do more than just look like they might lick the ground. Animal-like in many respects, they actually digest almost every bit of the earth at one time or another, and make the rest of our lives possible in the process. Mysterious, and mostly hidden, we often forget about the fungi that are perpetually beneath our feet. In these rainy days, when we feel like our skin might either mold or get sucked dry by mosquitoes, the mushrooms thrive. Perhaps the earth is, in essence, sticking out its tongue – its Earth Tongues – to catch the raindrops. This won’t be the last time I write about fungi this fall! Britt A. Bunyard, PhD, Publisher and Editor-in-Chief of FUNGI magazine, will give a dinner lecture about fungi on September 23, and then lead a mushroom foray on September 24th. You can find the details at cablemuseum.org. These Earth Tongues have pushed their way up through the Earth using strong, chitinous cell walls inflated with water to a pressure up to three times that in your car tires! Now the Earth can catch raindrops on its tongues…Photo by Emily Stone. The wooden gate on the Community Garden’s deer fence squeaked slightly as I swung it back into place and hooked the latch. An acre of lush, vibrant, growing things stretched out before me. I love unspoiled, untrammeled nature as protected by the Wilderness Act--created 50 years ago this fall. But I also love nature that I can cultivate, care for, and eat. I started at the far end of my garden, first harvesting the green zucchinis and yellow summer squash. I also checked for fruits and leaves nibbled on by the invading woodchuck and army of thirteen-lined ground squirrels. I also carried a spray bottle with baking soda and water, a home remedy for the powdery mildew that threatens to wilt plants before the winter squash can ripen. Next I picked the ripe tomatoes, and shook my head at the blighted, withering leaves. Finally, I tugged a few of the tallest weeds out from among the onions. Biodiversity is generally desirable, but often my garden is more diverse than I would like it to be. The pea trellis (built by my oldest nephew and his papa) provided a yummy snack of sweet, crispy pods. I offered a handful to my garden plot neighbors, and struck up a conversation about harvesting, preserving, and organic pest control. The Cable Community Farm only allows organic-approved gardening methods, and generally attracts a pretty like-minded group of people. I love talking gardening with them. Finally, I settled into picking the ingredients for my next culinary cultivation: kimchi. Kimchi is a traditional Korean side dish made of fermented vegetables. I tried it for the second time last winter, and the spicy-sour flavors are growing on me. So, I picked the biggest head of Napa cabbage, pulled a few carrots, yanked out a gigantic daikon radish, and wiggled an onion from its shallow bed. From the row of hot peppers, I plucked three spicy-looking specimens. After an evening of washing, chopping, salting, rinsing, spicing, and packing, I ended up with a two-quart Mason jar full of veggies, salt, water – and bacteria. Yes, bacteria. Wild strains of lactobacilli bacteria were present on the raw vegetables, just waiting for the right conditions to go forth and multiply. The salty brine and oxygen-poor habitat of my Mason jar were perfect. In just a few days, I could taste the acidic tang of fermentation start to develop. This jar is an ecosystem in itself, and just like in other ecosystems, a succession of species transform the environment in ways that allow new species to prosper. In a forest, hemlock might succeed birch. In the jar, Lactobacillus plantarum is the climax species, after it kills off competing bacteria. By adding so much lactic acid to the brine that nothing else can survive, L. plantarum can maintain its own little habitat for months or even years. Just like me pulling weeds and choosing my friends, it creates just the type of community that will help it thrive. The nice thing is, we can eat live L. plantarum right along with the spicy cabbage and radishes, and it won’t hurt us. It seems ironic in the age of antibiotics and hand sanitizer, but this is food safety guaranteed by bacteria! The fermentation process also predigests the food, in effect, by breaking down larger molecules into smaller ones that we can deal with more easily. It is actually a carefully managed partial decomposition. The right bacteria to do the job were always on the plants or in the soil, just waiting to turn plants back into dirt. We simply harness the microbes for a bit, and then wait for the sweet—or sour—spot to stop the rot. My kimchi has become a magical mix between my garden and the wilderness. It’s acidic and alive – and it now lives in the fridge. From the garden community to the jar community, I had done my best to select the members I want, and eliminate those that could be harmful. Each day, when I eat some of the spicy cabbage leaves, the lactobacilli on them join the community in my gut. Just like the garden, just like the jar, my body is its own ecosystem, filled with hundreds of different species. For every human cell in my body, there are about 10 resident microbes. More than 99% of the genetic information I carry is microbial. Scientists are finding that the health of our inner microbiome and our outer communities have incredible implications for the health of us as individuals. You may think all of this is a little weird. I think it is wonderful to be part of so many exciting communities! And here’s a question for my community of readers: I’m trying to figure out the best way to publish a book of my Natural Connections columns. If you have any advice, encouragement, or suggestions for publishers, please send me an e-mail: emily@cablemuseum.org. Thanks! We find ourselves part of many layers of intersecting communities, nestled together like the leaves in this head of Napa cabbage being readied for the kimchi jar. Photo by Emily Stone. Pedaling happily along Lake Namakagon one warm evening, I caught a whiff of something dead on the breeze. Scanning the ditch, I soon saw the source: a mass of scraggly black and white feathers. Just ahead, perched on top of a utility pole was an osprey nest I’ve been watching all summer. It was silent and empty. My heart in my throat, I whipped around in a driveway and went to investigate. Sure enough, the hooked, black beak of the large, fish-eating raptor lay among the wreckage. My heart sank—definitely an osprey. Then a movement caught my eye. A large black beetle with pale yellow markings scurried out from among the feathers and disappeared underneath the carcass. Curious, but tamping down a slight feeling of disgust, I poked around with a stick, and found two more beetles – a smaller on one top of a larger one. These American carrion beetles lay their eggs on dead animals and fungi. Then the parents stick around to eat fly larvae and the larvae of other carrion beetles in order to give their own kids a competitive advantage for food. When they hatch, the beetle larvae eat both the carcass and other larvae, and possibly the dried skin and bits of leftover flesh. The larvae pupate in nearby soil to begin the cycle again. Osprey talons are one of the most amazing parts of their body, so I poked around at its feet, too. The skin looked puffy and dry, and out from underneath it squirmed dozens of little white maggots. Nature is quick, and no part of this osprey would be wasted. Sad as I was about the death of “my” local osprey, I was already formulating an article about the way that nature recycles itself, and no death is really the end of anything, only the beginning of many different things. These beetles would be food for something else –maybe a fish—that could in turn be caught by an osprey, and the nutrients would have gone full cycle. But the cause of its death still puzzled me. Why would an adult osprey be in the ditch? Owls often swoop low for mice and are hit by cars, but an osprey would not have dove through the trees to catch a fish on the pavement. Back at home, I checked online. According to the Animal Diversity Web created by the University of Michigan Museum of Zoology (http://animaldiversity.ummz.umich.edu/) both eagles and owls sometimes attack osprey adults and young. But how often does that happen? I wondered. Next, I called the education department at the Raptor Education Group, Inc., in Antigo, WI. They have a rehab facility, and I thought they might have anecdotal stories of eagle- or owl- injured ospreys coming in to get fixed up. I told the educator my story over the phone. “Can my supervisor call you back?” she asked when I finished. Surprised, I agreed. We often call REGI’s Director, Marge Gibson, with raptor questions, and she rehabilitated the great horned owl that Katie Connolly, our Naturalist/Curator, is now training to be an education raptor. But I know Marge is very busy, and wouldn’t think to bother her with just a curious question. Sadness was my first emotion – a sinking in my stomach, a feeling of despair and loss. Then, as I realized that a fellow human had caused these deaths, with a gun, on purpose, my feelings changed. The slight aversion I had felt when smelling the rotting carcass was nothing compared to this new wave of disgust. Decomposition is a natural process at least; mitigated by fresh air. This was totally unnatural and unnecessary, not to mention despicable. Across northern Wisconsin, several ospreys are missing from their nests. A barred owl was found shot near Lake Namakagon. Someone is on a killing spree. There is a legal investigation; these are federal crimes. But you can help, too. Don’t let someone brag about senseless destruction. Make it clear to them and their friends that you will think less of them as people if they kill needlessly. Help us to strengthen our culture where these actions are condemned and not condoned. Please call the Wisconsin DNR if you have any information about these crimes. Please help us keep these beautiful birds soaring in the sky instead of rotting in a ditch! American carrion beetles eat both the carcass and the other larvae on the carcass. These two beetles are starting a new generation, which will also feed on what’s left of the carcass. The cycle of life continues. Ospreys are beautiful raptors that eat only fish. They are an inspiration to watch soaring through the sky. The scent of sun-warmed pine needles tickled our noses when we stepped out of the car. Scrambling up the sandy road cut -- buckets in hand – we began immediately to pick little clusters of blueberries and drop them in. Plops were soon muffled by a thick layer of fruit. Midday sun warmed the backs of our necks. Happily, we picked and talked as our buckets filled. “Have you tried one yet?” I asked Kellie Solberg, one of the Museum’s summer interns. Kellie had eaten some tasteless store-bought berries year ago, and decided that she didn’t like blueberries. She came along on this picking expedition just to be sociable with Katie McKiernan, our other summer intern, and me. But I knew that these wild berries weren’t anything like those in stores. “Hey, those are pretty good!” came her typically enthusiastic reply. Katie and I chuckled, unsurprised. By this late in the summer, our interns are a perfectly functioning team. Junior Naturalist lesson plans seem to pop out of the ether connecting their brains, while inside jokes, good-natured teasing, and ideas for “adventures” keep us all laughing. They are a valued part of the Museum community. In this thin, sandy, acidic soil, getting the right suite of nutrients and water for growth can be tough. Thin strands of special fungi coil within the blueberry root cells and extend threads of hyphae outside the root. The hyphae act like root-extensions, drawing in nutrients and water beyond the typical reach of the blueberry. The fungi can also break down soil components to access nutrients that are otherwise locked away. This decomposition is an incredibly important part of a healthy ecosystem. The blueberry pays for this service by giving the fungi little sugar snacks. It is a mutualistic symbiosis. The blueberries’ vibrant community includes other things you might not think of, too: pollinating insects like honeybees and black flies; pest insects like blueberry maggot flies; beneficial wasps that parasitize the pests; wildflowers like bunchberry and dogbane that host the wasps; bearberry plants which also partner with mycorrhizal fungi; long-tongued bears with big appetites; and even wildfire—to help prune the blueberries (which stimulates growth) and clear the way for more sunlight (which stimulates flower production). The community also included three purple-tongued naturalists, for at least a short while. Eventually, though, our buckets filled. The summery sound of grasshopper wings clacking in flight seemed to make the sunshine hotter. We retreated to another sandy place – Sioux Beach on Lake Superior. As we cooled our toes, plans began to emerge for what to do with the buckets of berries. I have many fond memories of “helping” my mom make strawberry jam as a kid, and eating it all through the winter. I’ve been jamming on my own since becoming interested in wild edibles (aka free food) in college. I was surprised to learn that neither Kellie nor Katie had ever canned anything. As I explained the process to them, and the importance each step, I realized that we were attempting to create the opposite of the living, thriving community where we’d picked the berries. 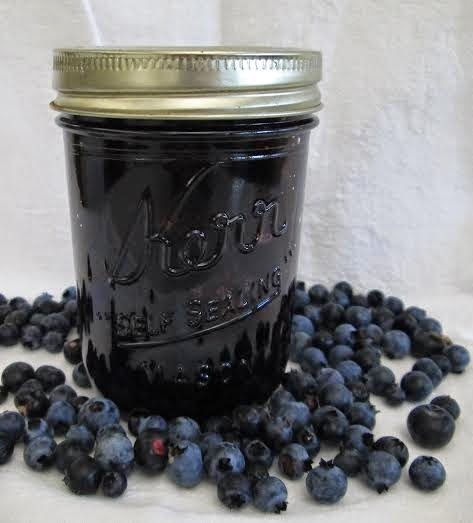 In order to keep for a year without refrigeration, all bacteria that could possibly be in the berries or in the jars needed to be eliminated. We basically needed to stop the process of decomposition. Adding acidic lemon juice allowed the bacteria to be killed at boiling temperature, instead of the 240 degrees it takes in low acid foods. Adding sugar also slows the growth of bacteria, while sterilizing the jars and lids in boiling water reduces the chances of contamination. Processing the filled jars in a hot water bath for 10-20 minutes causes the fruit to expand, force extra air out of the jar, and then seal with a vacuum as it cools. Each lid gave a metallic “plink” as the metal inverted, eliciting a satisfied smile from all of us home canners. In place of the diversity and life we encountered in the fields, we ended up with delicious—but sterile—jam, ready to sit on a shelf until the bitter winds of winter howl outside. On a particularly dreary day, we can open a jar, and savor the wild taste of sun-warmed pine needles, feel the midday sun, and remember the touch of water lapping at our toes. Find us on the web at www.cablemuseum.org to learn more about our exhibits and programs. Discover us on Facebook, or at our blogspot,http://cablemuseumnaturalconnections.blogspot.com. Blueberries live in a vibrant community, full of fungi, wasps, bears, and hungry naturalists. In order to preserve them as jam, we must eradicate all that life – but not the flavor of summer. Photo by Emily Stone.